These waffles are soooo good! The nuts and oats in these waffles provide healthy fats and whole grains, making Wonderful Waffles a great way to start the day! 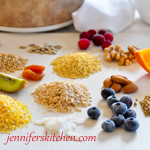 Place all ingredients in blender and blend until very smooth. This may take several minutes if you don’t have a very powerful blender. Immediately, pour batter into hot, oiled waffle iron. Be sure to cover the entire surface of the iron (including the corners) with the batter. Bake on medium-high. When steam stops rising from iron (after about 13 to 15 minutes) and lid lifts easily, check waffle for doneness. Baking time will vary a great deal as some waffle irons bake hotter than others. Large waffles take longer to bake than smaller ones. Waffle is done when it is nicely browned. 1. Do not make waffle batter ahead of time. It will thicken too much and the waffles with turn out heavy. Rather prepare it right before pouring it into the hot iron. 2. Do not open waffle iron until waffle is close to being done. When waffle is done, the iron lid will lift easily. If lid does not lift right up, then the waffle needs a little bit more baking time. 3. These waffles take a little longer to bake than ordinary waffles that contain baking soda or baking powder. (We like to avoid baking soda and powder when possible as they aren't good for the bones or for digestion.) However, your patience will be rewarded with good health and a delicious breakfast! 4. These waffles freeze nicely. Just heat in the toaster before eating. These waffles are quite tasty topped with Berry Berry Sauce, Strawberry Applesauce, or even Blueberry Smoothie. Wow…Great video. I love how it’s structured. Very creative! I’m glad you took the “Pinch of Yum” challenge! Thank you, Liz. We had a lot of fun creating it. Love the video can’t wait to try the waffles and sauce. My son just became vegan, so I am very excited to make these. 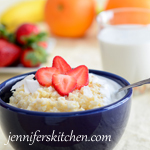 Just wondering–I’m assuming you used Old Fashioned Oats, do you think I could also use the Quick Cooking Oats? Since you blend it all up….I was thinking maybe yes….. 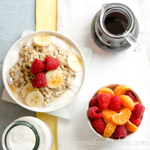 Yes, you can use either old-fashion oats or quick-cooking oats. I ended up using old-fashioned–I thought I was out, but I wasn’t. Good to know about the quick oats, though. Thanks!! I made these and they were very good. My husband had his with a little peanut butter and sliced bananas. My son just became a vegan–so he got to eat them, too! I can’t wait to try the berry sauce. Thanks for posting (or re-posting) this! Loved your video, saw it on Pinch of Yum. Now I’m subscribed to your blog! 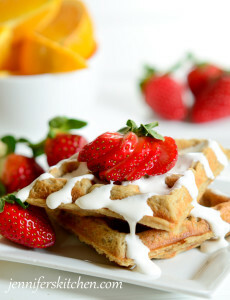 These waffles look amazing – I can’t wait to make them! I LOVED the video as well, very creative! Just a question, do you have the recipe for the skinny cream topping? I did go to the ‘link’ provided, but couldn’t find the recipe there. My waffles just won’t be the same without the skinny cream topping! The Skinny Coconut Cream Topping is from my weight loss program, which is a subscription-based program. 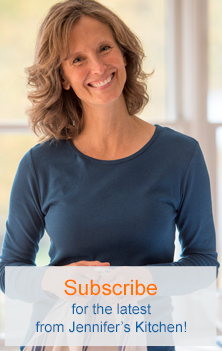 Subscribers get access to all the recipes and other help, tips, etc. Love the video and the healthy waffle recipe. Makes me want to purchase a waffle iron asap! Thanks! These look scrumptious! Do you have any more info about baking powders and soda on digestion? I’ve been suspecting for a while now that baking powder is not my intestines friend, but have never found any information about it. Baking soda and baking powder (even aluminum-free baking powder) alter the pH of the stomach and irritate the digestive lining. I think it makes a difference in digestive health. Will this batter be good for pancakes as well, or is it too thin? I don’t think this will work for pancakes since it’s the steam caught in the hot waffle iron that makes these egg-free, baking powder-free waffles rise. Just made your waffles and they are great. Unfortunately I have a very old waffle iron wich belong to my grandmother. So I switched it off by 5 minutes and again by 8 minutes. I’m glad you liked the waffles and that you were able to make them work with your grandmother’s iron. These look incredible for after a hard workout! I was just wondering, could I sub either almond flour or cashew butter for the almonds or cashews? (I guess I’m wondering how ground up they get in the blender!) I usually don’t just buy raw nuts because they’re too calorie dense for me to keep around! If so, what would be the appropriate amounts to sub, or should I just experiment? Thanks! You should be able to substitute almond flour for the almonds. 1/3 cup of whole almonds equals almost 1/2 cup of almond flour. Love the video … well done! I cannot seem to find the Skinny Cream Topping on your web site. Help! The Skinny Cream Topping is part of my weight loss plan, which is subscription based. You could use the topping in this recipe instead. Thank you! These are delicious! I made a double batch and my kids (there are 4 of them) still wanted more! Nice Video! I can’t find the Berry Berry Sauce on your site any longer, I wanted to share the link with a friend but can’t find it. Let me know when you put it up, thanks!! I’m glad you like the video. Thanks! hat Berry Berry sauce was delicious, I even saved some as a topping for homemade pineapple ice cream and was the perfect touch. I added some more grape juice to get it more runny for the ice cream. Thanks again! Let me know when you post those attrative cookies recipe that are with the Brazil milk!